We continue to strive to make riding of the Icelandic horse as accessible as possible to as many young riders as possible. As a charity - we rely on the generous support of our members to help support the activities of young riders both at home and internationally. Many thanks to all of you who give your time and resources to helping the young riders. 2013 - Sandy representing Team GBR at World Championships in Berlin as a young rider. By supporting the youth riders of IHSGB today - you are supporting their development now and for the future. In 2011 we introduced a new scheme for you to help them - 'hoof prints'. Each 'hoof print' is available at £10 and all money raised will be available for all youth riders at a range of activities. You can purchase any number of 'hoof prints' at any regular interval - one hoof print as a one off - 4 hoof prints each year - it's up to you!! We will use the fund as it grows to help develop our riders now and for the future, offering an accessible training scheme for them and supporting them on their journey with the Icelandic horse at home and abroad. Your support is appreciated and like all seeds - blossoms will grow! To sponsor a 'hoof print' and receive your certificate - simply click on the 'hoof prints' button. We will keep you up to date with all the youth activities here and you can see how the 'hoof prints' are making a difference to our young riders. Many hoof prints lead to International success! One of the wonderful opportunities that are available for our young riders is the chance to participate in FEIF events. 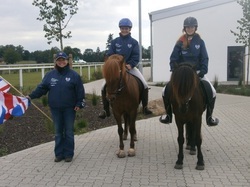 In 2012 - the FEIF Youth Cup (World Youth Championships for Icelandic horses) were held in Germany. Our young riders are also invited to participate at Senior level in International tournaments under the banner of 'young rider' (16 - 21), and for the first time in 2012, 2 of our riders participated at MEM. With the prospect of encouraging more participation in sports events for our young riders and our desires to build a strong team of young riders to attend International competition - we appeal to you to help train, build and support these youngsters on their journey through from young riders to senior. The Hoof Prints you donate are important in making these dreams come true. Hoof prints @ home too! Each small step that our young riders take at home in their development as young horsemen can be supported by your hoof print. 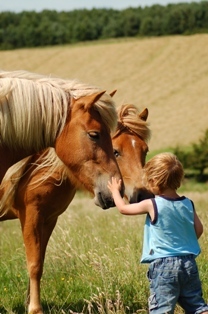 Our aim is to make riding of the Icelandic horse as accessible for as many young members of IHSGB as possible - no matter what their social background is. The fund will enable support to our young riders in attending events / training and together we can watch their development and encourage them to fulfill their dreams with the Icelandic horse.